Howard McMinn Manzanita is known as 'everyman's manzanita' for good reason. It is tolerant of a wide variety of garden conditions including clay soils, summer watering, pruning and shearing. 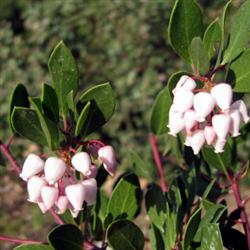 so if you know nothing about native plants but would like to try a manzanita we suggest you start with Howard McMinn. This is a medium sized shrub with fine textured bright green foliage and red bark. Pink flowers appear in late spring. It is one of the last manzanita's to bloom so if you have other manzanitas, including a Howard McMinn will extend your manzanita bloom time. At maturity Howard McMinn can reach 8 feet and spread to 10 feet or more. However, you can keep it in check by pruning. As it matures it will open up and reveal more of it's twisting, red colored branches. Howard McMinn' is excellent when you are trying to transition from a watered flower bed to a drought tolerant area. Moths, hummingbirds, butterflies and all sorts of other native wildlife like the plant. Howard McMinn' does fine in beach sand or adobe. An excellent hedge plant for that small hedge between you and the neighbors. My garden is 3 years old and this was the first time it bloomed. Gorgeous, showy pink bells... people were asking me for its name!